But surely this is just showing off? This wasp-shaped dollop of sunshine is the Australian Hornet, a potter wasp hailing from western Australia. The fact that it's a potter wasp means it isn't an actual hornet. 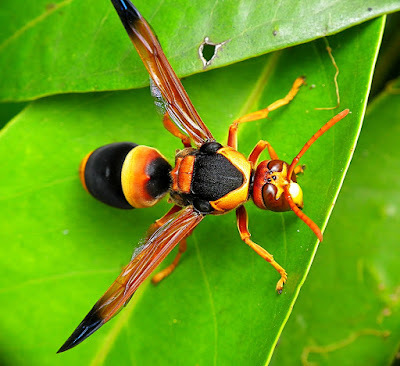 Real hornets are the 20 or so species of social wasp in the genus Vespa, NONE of which live in Australia (weird, I know. All those snakes and spiders and crocodiles and jellyfish, yet not single hornet! Australia really dropped the ball on that one). 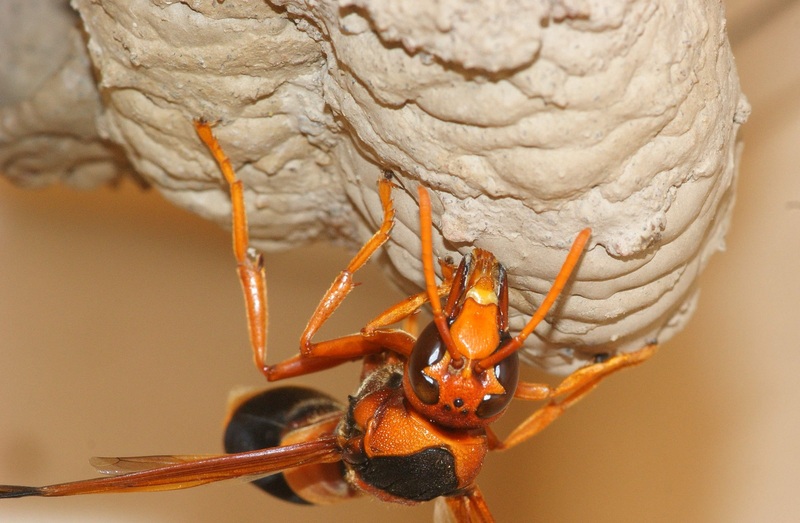 Potter wasps, by contrast, are more than 3,000 species found all over the world, and they're all solitary. 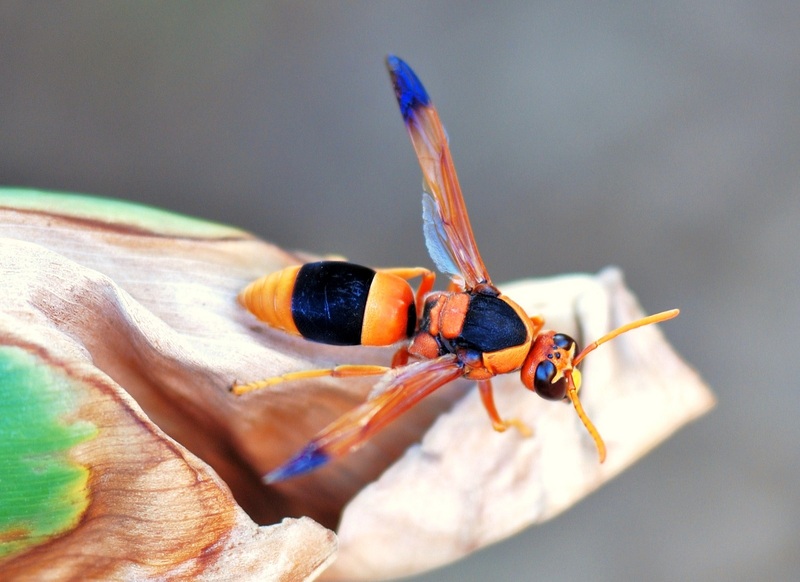 Being solitary, Australian Hornets go about their days on their lonesome. They're BIG at some 3 cm (1.2 in) long but luckily they're not at all aggressive. They've got far too much work to do for them to go around stinging anyone who looks at them funny. Especially since funny looks accompanied by screaming, shrieking and wildly flailing arms is par for the course when you're an inch long wasp. And what is all this work they have to be getting on with? 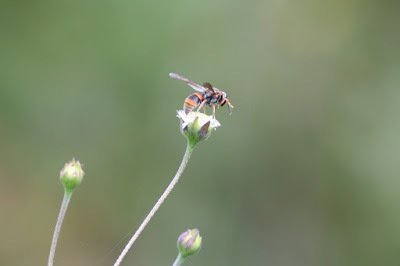 They're potter wasps. They gotta pot! Well, the females do, anyway. And thanks to some very careful, expert level wasp-watching, we've got a good idea of just how much work they have ahead of them. First they need to find a cosy niche to build in, somewhere a little gloomy and sheltered from the rain. Then they have to find some building material. Mud, basically. But it would be far too easy to simply gather some mud. They'd rather make it themselves. That means they have to find a source of water, a source of dirt, mix them up in their gob and bring it back to the construction site mouthful by mouthful. It ain't easy! Next, she starts building a cylinder called a cell. It's simple stuff, but it still takes a long time. Thanks to that expert level wasp-watching we know that in one particular instance it took almost 5 hours to complete a cell! And the wasp had to gather new supplies of mud 74 times to do it. Then she spent 2 hours building a little funnel that led into the cell. And then she spent 40 minutes fine tuning the funnel to a smooth and shiny finish. The funnel is very delicate, just 1 mm thick at its rim, and the Australian Hornet has little hairs on her legs which she uses to smooth and polish it. What next? Can she pop in, put her feet up and watch some telly? No, of course not. She might pop in, but only to clear out debris. And the only thing she'll be watching is the world in general with all its parasites and assorted ne'er do wells. She'll aggressively defend her nest, not just because of all the work she's put into it, but also because of the old, "won't somebody please think of the children?" She built the nest for the little 'uns. The sprogs. 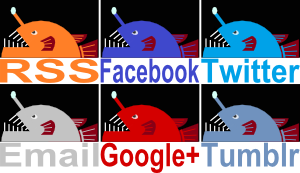 The grubs. Her offspring. 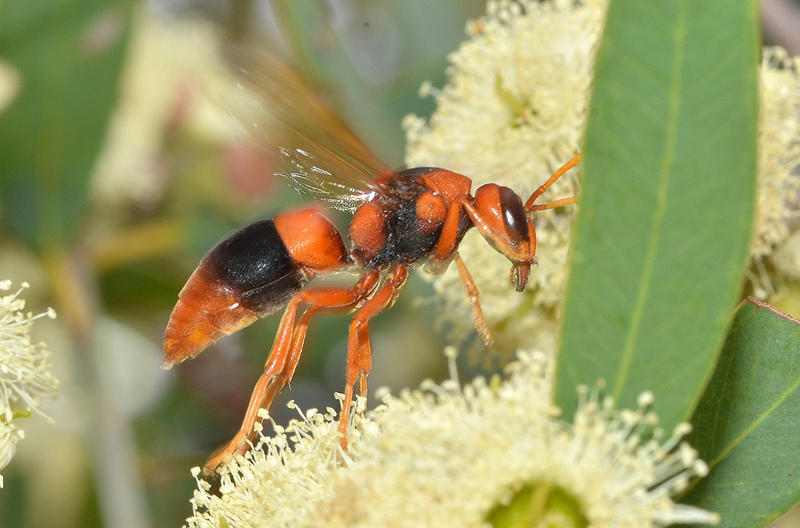 Unfortunately, while the adult Australian Hornet can go about lapping nectar from flowers, her young are completely incapable of acquiring their own food. Oh, dear. Back to work. So now the Australian Hornet goes out in search of food for her young. Not nectar, only adults eat that, but other people's young. Youngsters who can get their own food. Youngsters who, sometimes, can even build their own home! In other words, caterpillars. Soft, juicy caterpillars. It's a baby Australian Hornet's favourite food, so their dutiful mother flies around trees and shrubs to find them. 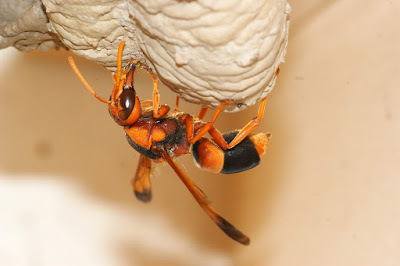 Even when caterpillars are hidden in their own personal nests, made of leaves folded up and held together by silk, the Australian Hornet can chew her way in and extract its podgy inhabitant. Work, work, work! Whatever happened to not having to physically do anything? When she captures the caterpillars she'll give them a paralyzing sting, haul them off to the nest and pack them into the cell. Then she'll do it again. And again. After about a week, the cell is full of all the food a growing but otherwise lazy grub needs. NOW can she sit back, pat herself on the back and relax? No! Of course not! Now she does the whole thing all over again. And again. And again. A single nest doesn't contain one cell, it contains somewhere between six and eight of them. Each cell takes hours to build, days to provision, and serves just one solitary grub. Eventually she ends up with a vast mud-nest significantly bigger than herself. Phew! I bet the whole "social" thing starts to sound like a mighty good idea once your nest starts to approach the size of a hotel! How about now? Can she sit back and relax now? Erm... not exactly, no. Throughout this whole process she constantly takes time out every few days to fix up the outside of the nest. She gets yet more mud and uses it to fill in the gaps, make sure it's all securely attached to whatever surface its built on and smooths everything out. Eventually the rough and bumpy nest is a smooth fortress with walls up to 1 cm (0.4 in) thick. The whole process takes so long that some of her young will emerge as adults while she's still provisioning the latest cell. You might ask what the males are doing all this time. The answer is that they're being a nuisance. They hang around by the water sources or loiter near the nest and try and pounce on the female while she's working. Sometimes she shrugs them off, sometimes she mates with them, sometimes she mates with them more than once. Sometimes she mates with one male a few times, and then another male a few times more. Either way, once she's done with them, she goes right back to the grindstone and continues with her work. Phew! I'm exhausted just thinking about all that. I think, I'm going to sit back and relax! We've always had these "hornets" around our pottery at school pinching our clay when we recycle it. Didn't know how useful they are in the garden though. Thanks, this is very instructive for our students.